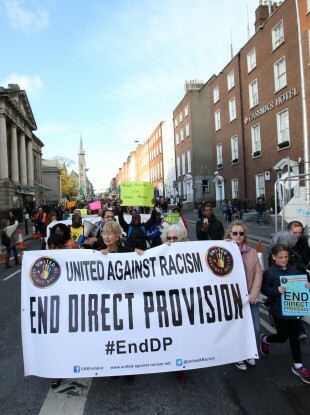 A protest against the Direct Provision system for Asylum Seekers in Dublin in November. THE NEW STREAMLINED process for asylum applications in Ireland will accept its first applications from today, but an advocacy group is warning that current large backlogs in the system will mean that the benefits of this new system may be not be felt immediately. The International Protection Act 2015 has introduced a “single procedure” which allows for applications for refugee status and subsidiary protection to be considered in one application. The United Nations High Commissioner for Refugees (UNHCR) has welcomed the new system, saying that it should “dramatically cut the length of time asylum-seekers spend in Direct Provision centres”. With the numbers of people waiting on asylum decisions in Ireland remaining high, however, the UNHCR says the backlog that the new system will start with may take a considerable time to clear. The “single procedure” system will replace what the UNHCR calls a “multi-layered process” that can lead to long times spent in Direct Provision centres. Under the previous system, an application for asylum was made to the Office of the Refugee Applications Commissioner (ORAC). A negative determination could then be appealed to a separate body, called the Refugee Appeals Tribunal. If that appeal was rejected, a separate submission for subsidiary protection status would need to have been made to ORAC to remain in the country. Enda O’Neill, head of office at UNHCR Ireland, said: “The new procedure should speed up decision making and reduce the amount of time asylum-seekers spend in Direct Provision centres. “Focus on Direct Provision should not relate solely to accommodation and living arrangements of asylum-seekers but to the determination process that means they spend long periods of time waiting for decisions on their applications. Quick recognition of those in need of protection will ensure shorter durations in state reception centres. Upon the publication of the McMahon report last year, it was said that there were over 3,500 asylum seekers who had been living in Direct Provision for over five years in Ireland. The report also revealed that the average waiting time for an asylum application was 70 weeks. According to figures from the Department of Justice, there were 4,740 asylum-seekers waiting for a decision on their application at the end of 2015. UNHCR has said that it is disappointed that there there has been so significant reduction on this in 2016. Other new procedures introduced to refine the process for refugee applications relate to what is now termed as “permission to remain”. This will be assessed under the new system in a parallel process to the asylum application. If an applicant is refused an asylum, they can appeal to the newly-established International Protection Appeal Tribunal. If they are unsuccessful in this appeal, they can then call a further review of their “permission to remain” decision will then be made available. New measures to facilitate the voluntary return when an asylum application has been turned down have also been introduced. With the number of applications still in the system, the UNHCR are worried that the newly streamlined process could take some time to show tangible benefits. O’Neill said: “[We] urge the government to ensure there are sufficient resources allocated to bring overall processing times down over the next 12 months. The UNHCR added that it is encouraged that recommendations from the McMahon report have been adopted, that will see existing personnel and processes carried over into the new system for applications. Recent figures published by the ESRI showed that the number of refugees resettled in Ireland has doubled since 2014, but the author of the report said that Ireland was resettling a small amount when the wider refugee crisis is put into context. Concerns around the International Protection Act 2015 were also raised in the report, which the ESRI says will limit the scope of family reunification for refugees in Ireland. When the Act is fully commenced family reunification will be restricted to a refugee’s immediate family members and a 12 month time limit for applications will be introduced. Where possible, Ireland currently resettles whole nuclear families. Email “Rule change should lead to less time in Direct Provision centres for asylum seekers”. Feedback on “Rule change should lead to less time in Direct Provision centres for asylum seekers”.